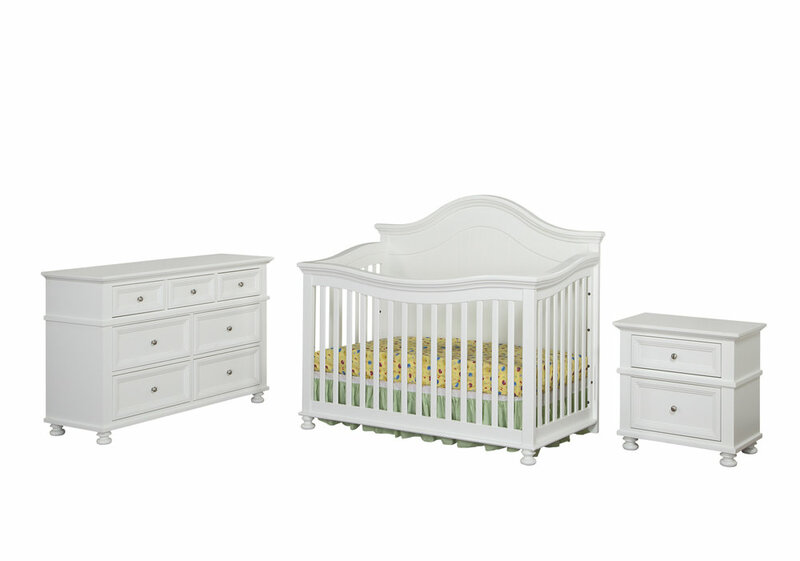 Caramia Furniture offers 5 different crib collections in various colours. These modern designed cribs can nurture your baby until their teens. All cribs convert into a day bed, and double bed with the use of an extension kit. Natural chic meets practical functionality with the Ambry 3-in-1 convertible crib collection. This modern crib features an extra drawer to keep baby's essentials close at hand. The Ambry convertible crib has 3 adjustable mattress positions and grows with your baby, converting to a day bed and full bed with the extension rails provided. A box spring will be required when the crib is converted to a double bed. Available in non-toxic finish White 2-tone, the Ambry convertible crib seamlessly fits in with any nursery style. Made of solid New Zealand pine, the Ambry convertible crib brings years of quality, style, and convenience to baby's nursery. The Barclay nursery collection offers a modern contemporary look and design. The collection is offered in a lovely burnished grey finish that is clean and timeless, making it perfect for a boy or girl. This collection will see your baby all the way through their childhood and into their teenage years. A box spring will be required when the crib is converted to a double bed. The Belgian crib collection offers a modern contemporary look and design. Available in n a beautiful pebble grey, white and antique coffee finish, that is perfect for a boy or girl. This 3-in-1 crib will see your baby all the way through their childhood and into their teenage years. A box spring will be required when the crib is converted to a double bed. The Belgian 3-1 convertible crib transforms from a crib, to a day bed, to a double bed. The double bed conversion rail kit is provided. The Belgian 7-drawer double dresser is the perfect complement to the Belgian crib. The dresser can be used with the contour pad as a changing station for your newborn baby. As they get older it has lots of space inside to house their clothes. The Belgian 2-drawer night table completes the collection perfectly. Offering the same high-end finishes as on the double dresser, use the night table to house your baby monitor when using the crib, and then a lamp when you transform the crib into double bed stage. The Garnet crib collection offers a modern contemporary look and design, in a beautiful java finish, perfect for a boy or girl. This crib will see your baby all the way through their childhood and into their teenage years. A box spring will be required when the crib is converted to a double bed. The Garnet 3-1 convertible crib transforms from a crib, to a double bed. The double bed conversion rail kit is provided. Featuring 6 drawers with dovetailed joints and drawer glides, the Garnet double dresser is the perfect complement to the Garnet crib. The dresser can be used with the contour pad as a changing station for your newborn baby. Finally, the Garnet 2-drawer night table completes the collection perfectly. Offering the same high-end finishes as on the double dresser, use the night table to house your baby monitor when using the crib, and then a lamp when you transform the crib into double bed stage. The Jessie nursery collection is classically styled with tremendous appeal. A graceful arch highlights the elegant crib. This collection is made from solid New Zealand pine and offered in a lovely pebble grey and white finish. The 7-drawer double dresser and nightstand include brush nickel accents on drawers, double glides, and dovetail joints on drawers which are added features that will make the furniture last for many years. This timeless collection will see your baby all the way through their childhood and into their teenage years. A box spring will be required when the crib is converted to a double bed.